The U.S. Women National Team is participating in the She Believes Cup tonight, which will feature four of the world’s top teams in the USA, Germany, France and England playing in three doubleheader events at three different venues over a seven-day period. England will open the tournament against France on March 1 at Talen Energy Stadium (4 p.m. ET; FOX Sports GO), followed by the U.S. against Germany (7 p.m. ET on FS1). 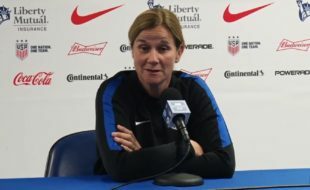 Head coach Jill Ellis, Alex Morgan, Carli Lloyd and Christen Press talked to the media on Tuesday ahead of the tournament. PSP was there.